A good friend of mine from high school called me a few weeks ago. He told me that he had just bought an investment property in my neighborhood, and that it was full of stuff from the last resident. Then he made me an offer I couldn't refuse. He needed to clean out the house, I need to pack my garage full of junky old furniture. It was a win-win situation. One of the pieces I brought home was this solid oak computer armoire. I didn't want a computer armoire. No one buys a computer armoire anymore, but my good friend practically begged me to take it off his hands, and for a more than reasonable price. So, I obliged. Here's how she looked before. And after several coats of black paint and pre-catalyzed lacquer, here she is. Man, black paint is so hard to photograph! I swear, it looks great in real life. 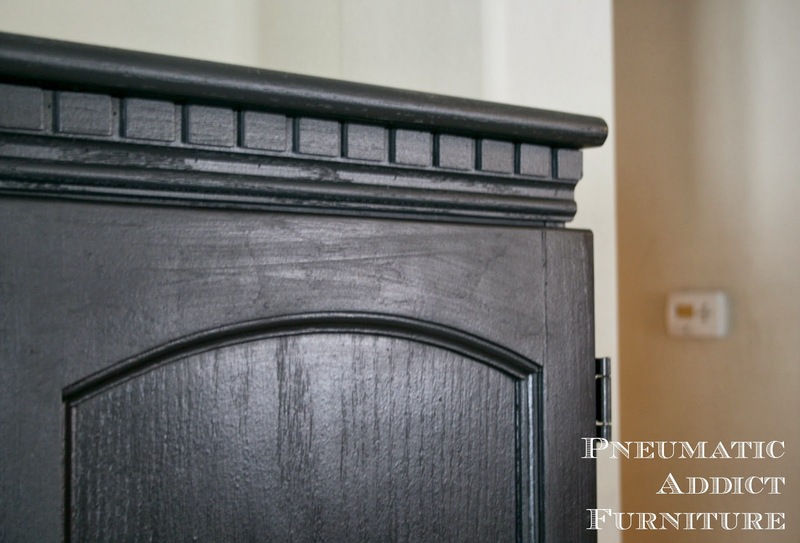 Solid black furniture sells well, but is so boring! I decided to spice things up a little on the inside. The whole interior was primed and sprayed with multiple coats of an aqua blue I had in the garage. 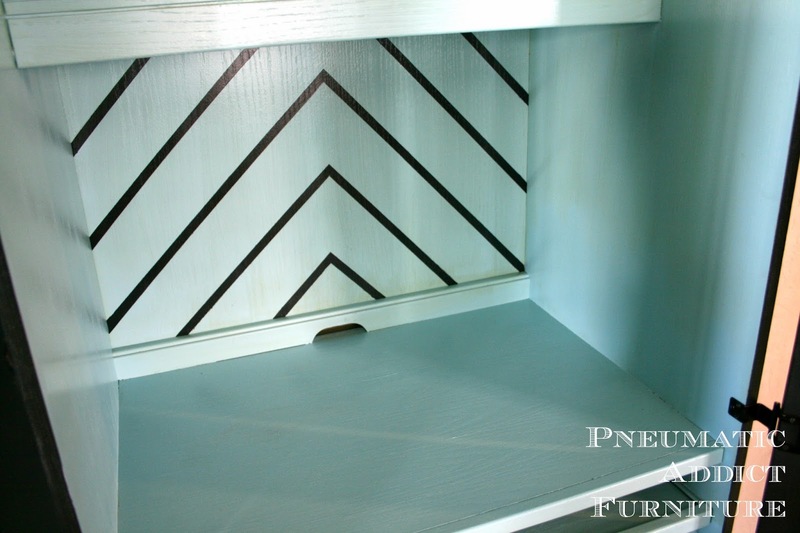 Then, to give you something interesting to stare at while you use the desk portion, I added a chevron/arrow design. 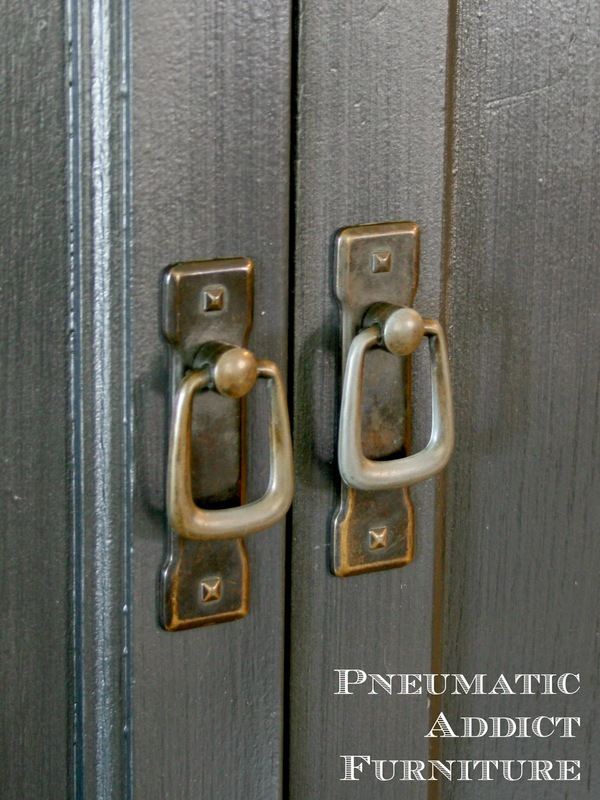 I like the wear and patina old brass hardware gets, so I simply reattached the original pulls. 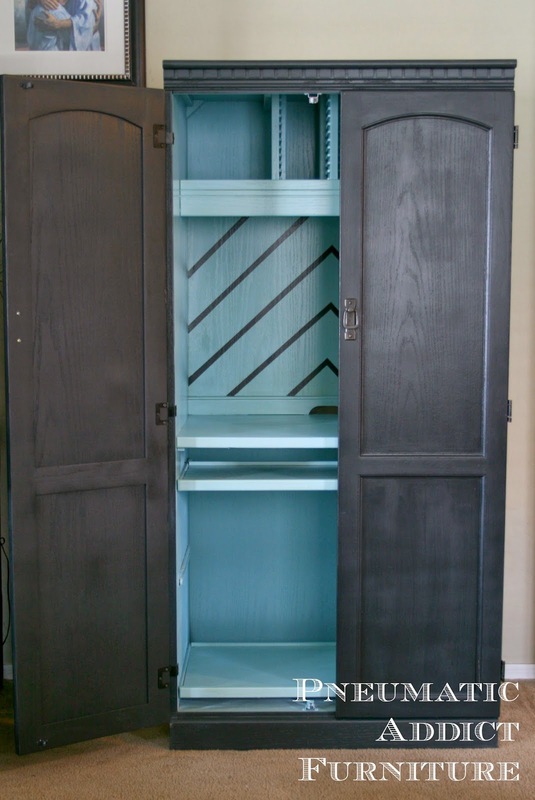 This armoire is simple, but is built like a tank and has some pretty details, like the dental moulding across the top. What do you think? Is the blue too crazy? Or just crazy enough? I love the blue inside! 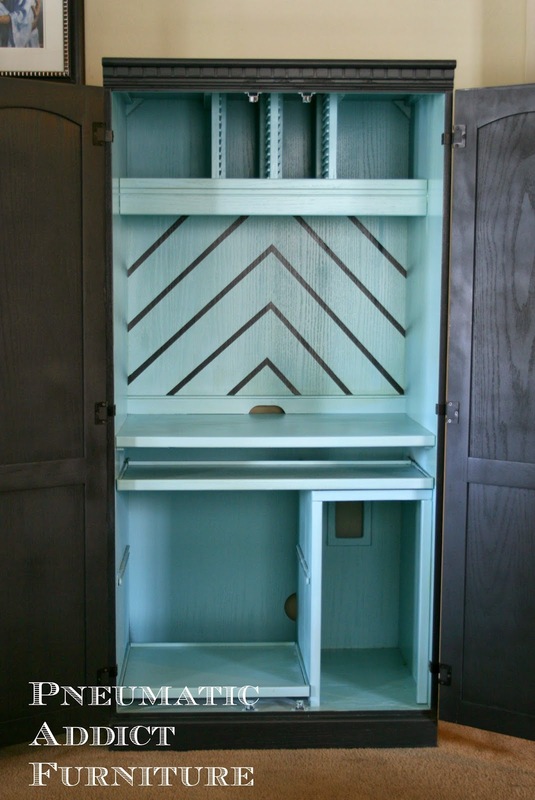 It gives it the personality it needs, and I love the chevron arrow design! Just crazy enough. ;) So fun!! Hi! I just found your blog and now I have been rolling through your entries, so you might find a few comments to old blogs:) I dont think it's to crazy at all! It's like a surprise inside!! I love that blue color! I love the chevron inside. 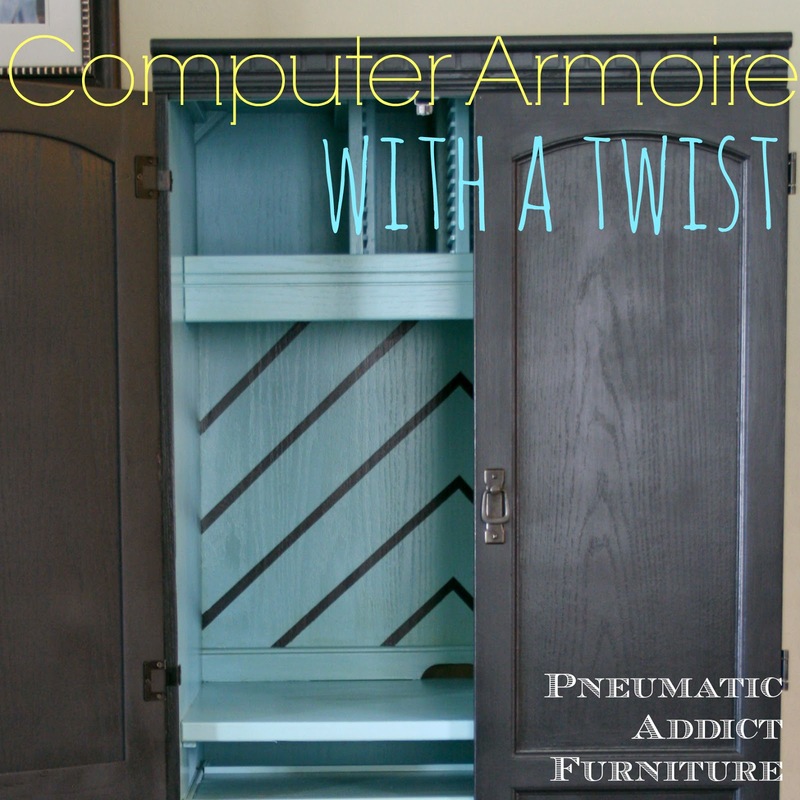 Yes, computer armoires aren't popular, but armoires are so versatile that I bet you or someone will find a good use for it. Excellent! I converted our old armoire to a temporary office while our office was getting a makeover. But yours is way cute! I didn't do much to ours since I knew it'd go back to holding a TV but now I'm tempted to paint it...I love how the hardware stands out more with the paint job. It went from country to more industrial - the wonders of paint! 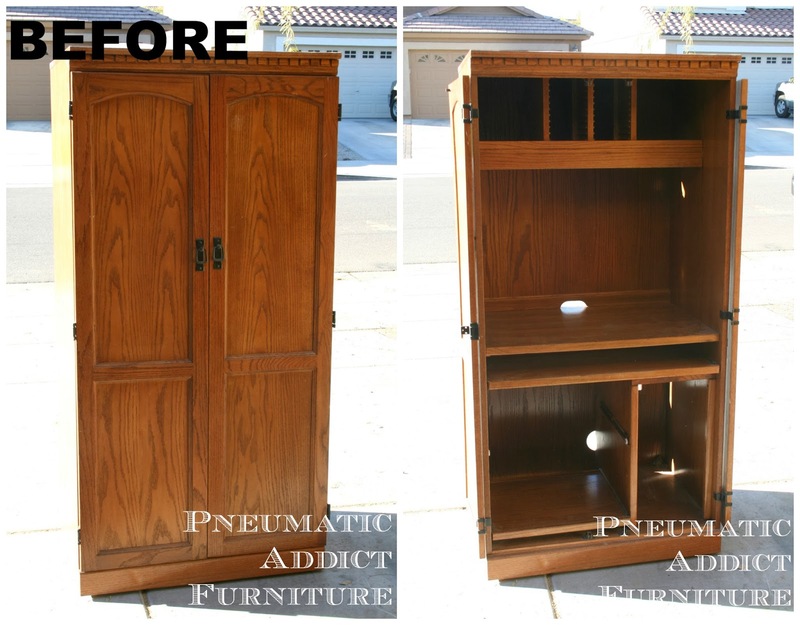 I love how you redid this, especially the inside! It just gorgeous!! So cute Elisha! I love the inside. That must have been one awesome phone call and pick up!! I love free furniture! Thank you for sharing at Redouxinteriors! Love what I you did with it :) Great idea on the inside!